I’ve taken a very long hiatus (nearly 5 years!) from this blog. I suppose getting married and getting an MD are good excuses, but Artem has very kindly let me return. And I greatly appreciate this chance, because I’d like to summarize an idea I had been working on for a while. So far, only two publication has come out of it (Xue et al., 2015a,b), but it’s an idea that has me excited. So excited that I defended a thesis on it this Tuesday. For now, I call it supply-driven evolution, where I try to show how the generation of variation can determine long-term evolution. Evolutionary theoreticians have long known that how variation is generated has a decisive role in evolutionary outcome. The reason is that natural selection can only choose among what has been generated, so focusing on natural selection will not produce a full understanding of evolution. But how does variation affect evolution, and can variation be the decisive factor in how evolution proceeds? I believe that the answer is “frequently, yes,” because it does not actually compete with natural selection. I’ll do a brief overview of the literature in the first few posts. By the end, I hope how this mechanism can explain some forms of irreversible evolution, stuff I had blogged about five years ago. We have now seen that man is variable in body and mind; and that the variations are induced, either directly or indreictly, by the same general causes, and obey the same general laws, as with the lower animals. — First line read on a randomly chosen page of Darwin’s The Descent of Man, in the Chapter “Development of Man from some Lower Form”. But this post isn’t about natural selection at all, so that quote is suitably random. In this figure, the number of systems is plotted against the number of components. As the number of components increase from 1 to 2, the number of possible systems greatly increase, due to large size of the space of all components ( ). The number of viable systems also increase, since I have yet to introduce a bias against complexity. In the figure, blue are the viable systems, while dashed lines for the 1-systems represent the space of unviable 1-systems. If we begin at the yellow dot, an addition operation would move it to the lowest red dot. Through a few mutations — movement through the 2-system space — the process will move to the topmost red dot. At this red dot, losing a component is impossible, since losing a component would make it unviable. To lose a component, it would have to back mutate to the bottommost red dot, an event that, although not impossible, is exceedingly unlikely if is sufficiently large. This way, the number of components will keep increasing. The number of components won’t increase without bound, however, as I said in my last post, once is large, there is enough arrows emanating from the top red dot (instead of the one arrow in the previous figure) that one of them is likely to hit the viable blues in the 1-systems. At that point, this particular form of increase in complexity will cease. I’d like to sharpen this model with a bit more rigor. First, however, I want to show a naive approach that doesn’t quite work, at least according to the way that I sold it. Consider a space of systems made up linearly arranged components drawn from . Among there are viable systems that are uniformly randomly distributed throughout ; any has a tiny probability of being viable. There is no correlation among viable systems, is the only probability we consider. There are three operations possible on a system S: addition, mutation, and deletion. Addition adds a randomly chosen component from to the last spot in S (we will see that the spot is unimportant). Deletion removes a random component from S. Mutation mutates one component of S to another component in with uniformly equal probability (that is, any component can mutate to any other component with probability). Each operation resets and the result of any operation has of being viable. Time proceeds in discrete timesteps, at each timstep, the probability of addition, mutation, and deletion are and respectively. Let the system at time be . At each timestep, some operating is performed on , resulting in a new system, call it . If is viable, then there is a probability that , else . Since the only role that plays is to slow down the process, for now we will consider . Let the initial S be , where is viable. Let be small, but . The process begins on , additions and mutations are possible. If no additions happen, then in approximately time, mutates to another viable component, . Let’s say this happens at time . Since , . However, since this changes nothing complexity-wise, we shall not consider it for now. A successful addition takes approximates time. Let this happen at . Then at , we have . At this point, let us consider three possible events. The system can lose , lose , or mutate . Losing results in a viable , and the system restarts. This happens in approximately time. This will be the most common event, since the chance of resulting in a viable or going through mutation to become a viable are both very low. In fact, must spend time as itself before it is likely to discover a viable through mutation, or before it discovers a viable . The last event isn’t too interesting, since it’s like resetting, but with a viable instead of , which changes nothing (this lower bound is also where Gould’s insight comes from). Finding is interesting, however, since this is potentially the beginning of irreversibility. timsteps before we successfully discover . Phew. For small , we see that it takes an awfully long time before any irreversibility kicks in. Unfortunatly this isn’t quite irreversibility. 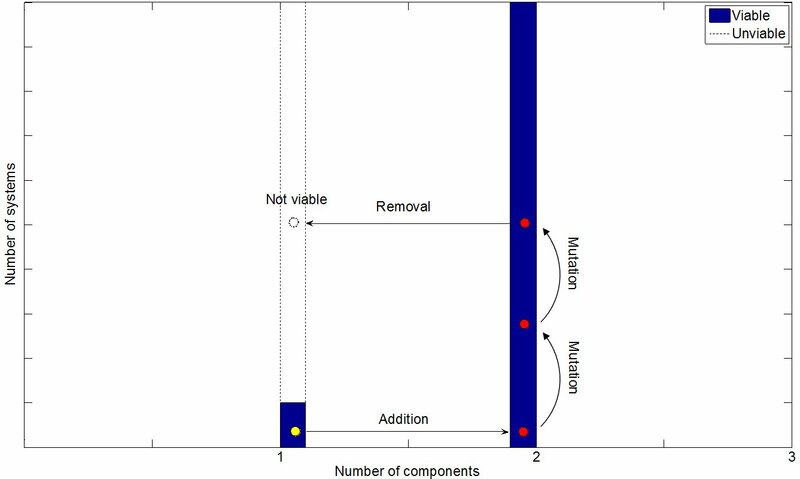 Now I will show that the time it takes for to reduce down to a viable single component is on the same order as what it takes to find viable or , in which all single deletions (for , the single deletions are: , , and ) are all unviable. time. Since are all relatively large numbers (at least compared to ), there is no “force” for the evolution of increased complexity, except the random walk force. In the next post, I will back up statements with simulations and see how this type of processes allows us to define different types of structure, some of which increases in complexity. 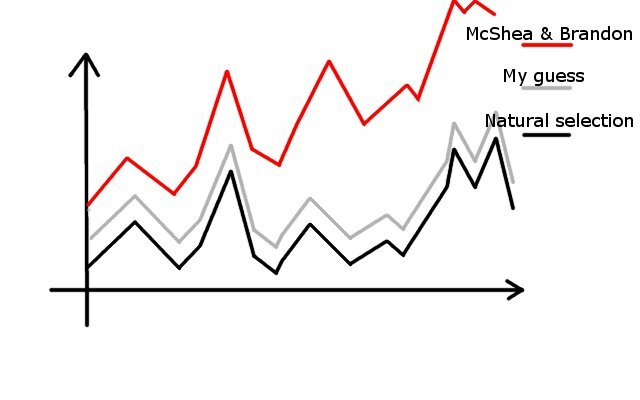 In the last post I wrote about the evolution of complexity and Gould’s and McShea’s approaches to explaining the patterns of increasing complexity in evolution. That hardly exhausts the vast multitude of theories out there, but I’d like put down some of my own thoughts on the matter, as immature as they may seem. My intuition is that if we chose a random life-form out of all possible life-forms, truly a random one — without respect to history, the time it takes to evolve that life-form, etc, then this randomly chosen life form will be inordinately complex, with a vast array of structure and hierarchy. I believe this because there are simply many more ways to be alive if one is incredibly complex, there’s more ways to arrange one’s self. This intuition gives me a way to define an entropic background such that evolution is always tempted, along or against fitness considerations, to relax to high entropy and become this highly complex form of life. I think this idea is original, at least I haven’t heard of it yet elsewhere — but in my impoverished reading I might be very wrong, as wrong as when I realized that natural selection can’t optimize mutation rates or evolvability (something well known to at least three groups of researchers before me, as I realized much later). If anyone knows someone who had this idea before, let me know! I will try to describe how I think this process might come about. Consider the space of all possible systems, . Any system is made up of components, chosen out of the large space . A system made out of n components I shall call an n-system. Of the members of , let there be a special property called “viability”. We will worry later about what exactly viability means, for now let’s simply make it an extremely rare property, satisfied by a tiny fraction, , of . At the beginning of the process, let there be only 1-systems, or systems of one component. If is large enough, then somewhere in this space is at least one viable component, call this special component . Somehow, through sheer luck, the process stumbles on . The process then dictates some operations that can happen to . For now, let us consider three processes: addition of a new component, mutation of the existing component, and removal of an existing component. The goal is to understand how these three operations affect the evolution of the system while preserving viability. Let us say that viability is a highly correlated attribute, and systems close to a viable system is much more likely to be viable than a randomly chosen system. We can introduce three probabilities here, one for the probability of viability upon the addition of a new component, upon the removal of an existing component, and upon the mutation of an existing component. For now, however, since the process is at at a 1-system, removal of components cannot preserve viability — as Gould astutely observed. Thus, we can consider additions and mutations. For simplicity I will consider only one probability, , the probability of viability upon an edit. 1) “Easy” processes: is small and is large. There are only a few edits / additions we can make to the system, and most of them are viable. 2) “Hard” processes: is very large and is small, but not too small. There are many edits possible and only a very small fraction of these edits are viable. However, is not so small that none of these edits are viable. In fact, is large enough that not only some edits are viable, but also these edits can be discovered in reasonable time and population size, once we add these ingredients to this model (not yet). The key point is that easy processes are reversible and hard processes are not. Most of existing evolutionary theory so far as dealt with easy processes, which leads to a stable optimum driven only by environmental dictates of what is fittest, because the viable system space is strongly connected. Hard processes, on the other hand, have a viable system space that is connected — but very sparsely so. This model really is an extension of Gavrilets’ models, which is why I spent so much time reviewing them! Now let’s see how a hard process proceeds. It’s actually very simple: the either mutates around to other viable 1-systems, or adds a component to become a viable 2-system. By the definition of a hard process, these two events are possible, but might take a bit of time. Let’s say we are at a 2-system, . Mutations of the two system might also hit a viable system. Sooner or later, we will hit a viable as a mutation of . At this point, it’s really hard for to become a 1-system. It needs to have a mutation back to and then a loss to . This difficulty is magnified if we hit as continues to mutate, might be a mutation neighbor to but not . Due to the large size of the set , reverse mutation to becomes virtually impossible. On the other hand, let’s say we reached . Removing a component results in either or . The probability that at least one of them is viable is , which for very small, is still small. Thus, while growth in size is possible, because a system can grow into many, many different things, reduction is size is much more difficult, because one can only reduce into a limited number of things. Since most things are not viable, reduction is much more likely to result in a unviable system. This isn’t to say reduction never happens or is impossible, but overall there is a very strong trend upwards. All this is very hand waving, and in fact a naive formalization of it doesn’t work — as I will show in the next post. But the main idea should be sound: it’s that reduction of components is very easy in the time right after the addition of a component (we can just lose the newly added component), but if no reduction happens for a while (say by chance), then mutations lock the number of components in. Since the mutation happened in a particular background of components, the viability property after mutation is true only with respect to that background. Changing that background through mutation or addition is occasionally okay, because there is a very large space things that one can grow or mutate in to, but all the possible systems that one can reduce down to may be unviable. For a n-system, there are n possible reductions, but possible additions and possible mutations. For as long as , this line of reasoning is possible. In fact, it is possible until becomes large, at which point the probability that the probability that a system can lose a component and remain viable becomes significant. Phew. In the next post I shall try to tighten this argument.